Peer-to-peer. The (past and) future of social. Why am I asking about obscure software companies? These now mostly-defunct software companies were trail blazers, the precursors to modern-day social media networks. Only the most important thing in the world, that’s what! A peer-to-peer (P2P) network is a type of decentralized and distributed network architecture in which individual nodes in the network (called “peers”) act as both suppliers and consumers of resources, in contrast to the centralized client–server model where client nodes request access to resources provided by central servers. In a peer-to-peer network, tasks (such as searching for files or streaming audio/video) are shared amongst multiple interconnected peers who each make a portion of their resources (such as processing power, disk storage or network bandwidth) directly available to other network participants, without the need for centralized coordination by servers. When you think peer-to-peer, it probably conjures up images of networks of interconnected servers, passing digital files between them. And you wouldn’t be far off. The internet did start off as a collection of interconnected computers, sharing data, after all. But I’m not talking about the hardware (or software) itself. There’s more to social media than file sharing. Social media is about sharing. Whether its a gif, photo, video, song or simply information, social media is THE way information gets disseminated online. But that’s just one part of the equation. The bigger issue are the peer networks – the underpinnings of social. At its core, social media relies heavily on peer networks. 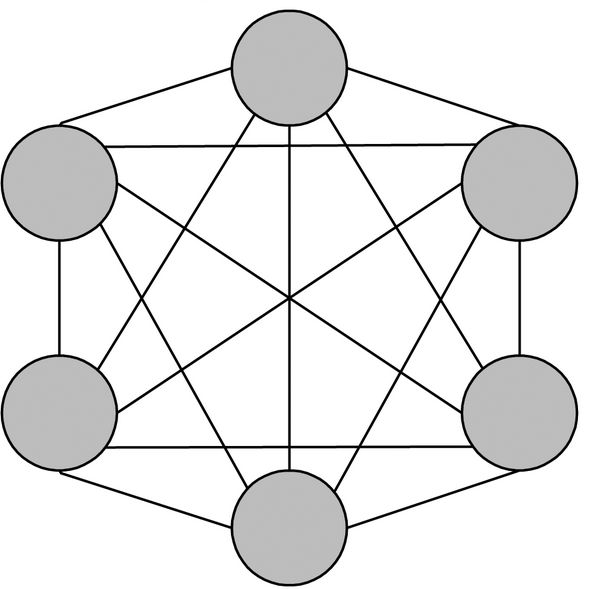 Nodes exerting influence on and over one another. Without the cooperation necessary to allow one computer to access another, peer-to-peer networks would never have come to be. Similarly, social networks work because of the inherent trust that exists between people. For the most part, being connected to someone (in a social media context) is like being vouched for in the Mafia. You’re vetted by who you’re connected to. The more connected you are, the more trusted you’re perceived as being. Sure, social media is (somewhat of) a popularity contest. But online, this popularity translates into trust. I feel like I’m rambling. Social has its origins in peer-to-peer networks. It was originally designed as a peer-to-peer network of Harvard students. Now it’s a collection of numerous peer networks. And all other social networks work in much the same way. LinkedIn. Twitter. YouTube. Instagram. Pinterest. Google+. As soon as you set up your account, what do you do? Find and follow all your friends. The folks most reach out to first are invariably people you already know. 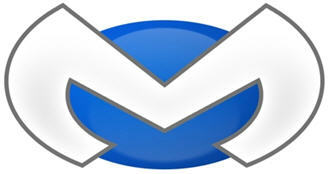 Not to say that we don’t extend our virtual reach beyond the safe confines of people we know. But when we do, there are usually less than six degrees of separation between us. What was the point I was trying to make again? Oh yeah…peer-to-peer networks are the underpinning of all modern day social networks. If you’re interested in building a successful social network presence, focus first on your peers. Those people closest to you, who you can rely upon to follow you, like your content and share. Without a whole bunch of cajoling, bribery and/or sexual favors. Once your peer network is in place, the sky’s the limit. Or at least getting that next batch of friends/likes/followers won’t be quite as difficult. Note: If this post comes of as rambling and incoherent, that’s because it is. But read it, re-read it, and re-read it again. It will eventually make sense. If you’ve been following the whole SOPA/PIPA debate, then you’re probably aware that today, January 18, 2012, Wikipedia went black to protest the introduction of the Stop Online Piracy Act and the Protect IP Act. The day Wikipedia went black. These two bills, one being introduced in the Senate and the other the House, are designed to allegedly protect copyright owners from the infringing conduct of offshore and overseas violators. In short, if a copyright owner believes that a website is selling counterfeit or pirated content, they can apply to the Court for an order which would then bar all links to the allegedly infringing site, stop search engines from making the site available and force ISPs to block access to the site. In addition, there would be criminal penalties for unauthorized streaming of content online. The debate rages passionately on both sides of the equation. The bills’ proponents, lobbyists for the film and music industry, say its necessary to prevent the rampant unchecked piracy overseas that are cutting into their profits and hurting copyright owners. Opponents of the bill, citing issues of inadequate due process, censorship and interference with free speech, believe that piracy can be combatted without these draconian laws. But we’ve been here before. Remember the music industry’s all out assault on peer-2-peer networks like Napster? And the spate of lawsuits that the RIAA rammed through the courts, dragging countless teenagers and their parents into court for alleged infringing conduct? And what did we learn from that? That these massive companies, the laws were designed to protect, actually ended up abusing the laws, violating due process and in too many instances, initiating action against people who had never, actually, infringed anything. What makes anyone think that if this law passes, that the exact same thing won’t happen? For the time being, it looks like SOPA and PIPA have stalled. Many commentators note that even if it passes both the Senate and the House, President Obama won’t sign it into law. But they also note that this doesn’t mean the debate is over. Not by a longshot. The movie and music industry lobby is fierce and motivated. After the 2012 elections, President Obama will be more likely to extend an olive branch to the entertainment industry, which has had his back since the 2008 elections. If a Republican is elected (God forbid), then it’s a foregone conclusion that these bills will be resurrected, and find their way into the law books. But for internet activists, like the Electronic Frontier Foundation, Wikipedia, Google, Mozilla, and others, this bill would likely have passed without much fanfare. But the ramifications are so far reaching, and impact so much of what we take for granted, that these organizations have made it their mission to fight SOPA and PIPA for all it’s worth. 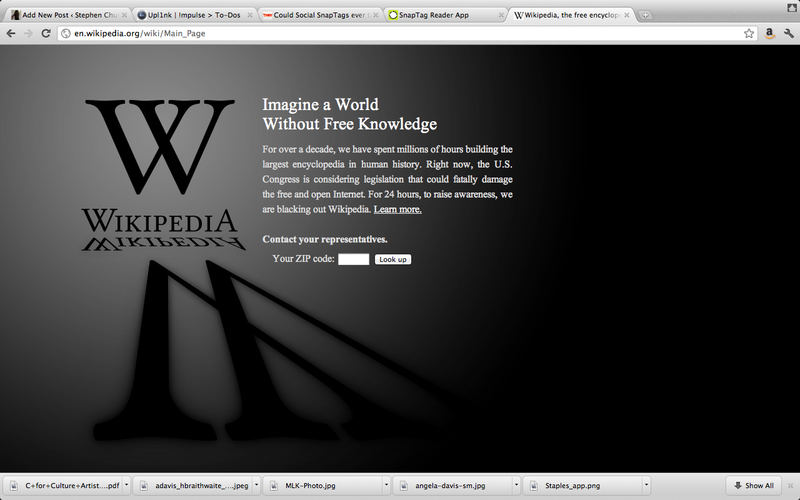 If you’re not up on this issue, Wikipedia has kept up these pages related to SOPA and PIPA for people to learn more about the issues. I, for one, have signed an online petition, contacted my Senator and Representative, and am encouraging everyone who reads this post to ring the alarm and let people know what’s going on. Don’t let big business become Big Brother and take away your rights.